Many Swedish recipes are based around fish and seafood, especially herring, which is unsurprising given the country's long coastline and maritime tradition. 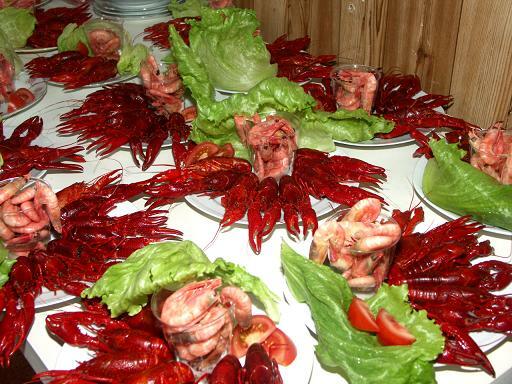 Crayfish are also popular in Sweden, and are especially eaten in August, when the Swedes hold crayfish parties known as "kräftskivor". On the other hand, Swedish recipes often contain relatively few vegetables - because historically there was limited choice of vegetables available during the long winters. 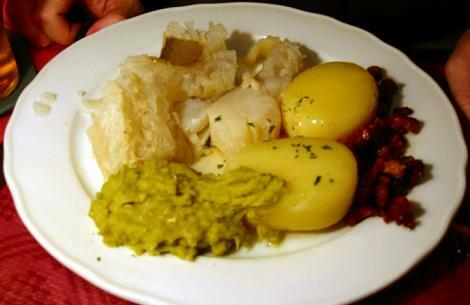 That said, Swedish dishes do make use of potato, rutabaga (known in the United Kindom as "swede"), turnip, and cabbage preserved as sauerkraut. Additionally, a jam made from lingonberry, which is a small flowering plant that grows wild in Scandinavia, is a popular condiment with many dishes. It probably would be fair to say that although some herbs are used in cooking, most Swedish traditional dishes are fairly plain, and the Swedes do not make use of spices to anything like the extent of some other countries. However, that does not mean that Swedish food is not tasty or satisfying. Knäckebröd - Knäckebröd is a crispy cracker-like bread made using rye. For breakfast (Swedish: frukost), the Swedes often eat in the form of open sandwiches, which are topped with topped with cold cuts, hard cheese, messmör (cheese spread) or even caviar. Smörgåsbord - Smörgåsbord is not so much a meal, as a style of eating. Many small dishes are prepared and laid out in a buffet to which guests and family members can help themselves. Smörgåsbord is especially popular during holiday periods, and is known at Christmas as "Julbord". Gravad lax - A popular appetizer, gravad lax is cured salmon with vinegar, salt, sugar and dill. It is normally eaten with a dill and mustard sace, and served with bread or potatoes. Inlagd sill - Pickled herring. Surströmming - Fermented Baltic herring in brine. Lutfisk - This is a very unusual dish made using stockfish (air-dried white fish). The fish - usually cod, but sometimes ling - is prepared using a multi-step process involving soaking in water, the in a mix of water soda lye (a caustic soda solution), and finally in water again. As a result the fish swells up and attains a jelly-like consistency. The fish is then cooked (usually by steaming), and served, most often with a white sauce containing pepper and other spices. Blodpudding - This is a blood sausage (like the British "black pudding"). Kåldolmar - Kåldolmar are cabbage rolls filled with rice and pork. They are served with boiled potatoes and gravy, and lingonberry jam. Janssons frestelse - This dish is potato, onion, and cream with with pickled sprat (Swedish: ansjovis), oven-baked. Because of the Swedish word "ansjovis", many people think this dish includes anchovies - it does not - anchovies are known in Sweden as "sardeller". Köttbullar - Köttbullar is meatballs made from ground (minced) meat (usually beef, but sometimes beef and pork mixed), with breadcrumbs, chopped onions, seasoning ans spices. The meatballs are traditionally served with boiled potatoes and gravy, and usually with picked cucumber and lingonberry jam as well. Kroppkaka - Potato dumplings, filled with pork and onions, and normally served with butter or cream, and lingonberry jam. Pyttipanna - Potatoes, onions, and sausage or ham, chopped and then fried together in a pan. Raggmunk - Pancakes made from potatoes. Köttsoppa - This is a meat (beef normally but sometimes reindeer or elk), and root vegetable soup. 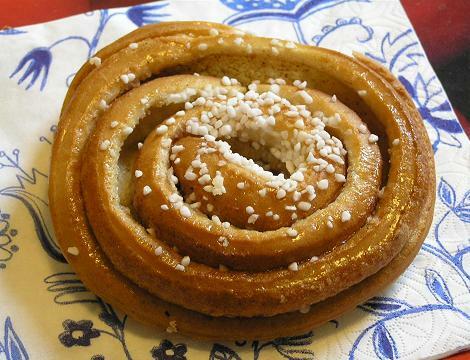 It is often eaten with plain simple dumplings (Swedish: Klimp) made from wheat flour, milk and egg. Smörgåstårta - This is a savory "cake" made out of layers of buttered bread with creamy fillings (egg and mayonnaise usually) between the layers, and topped as well. Many different fillings and toppings may be used, but common ones include caviar, liver paté, olives, prawns and smoked salmon. The dish is served cold, and cut into slices before eating. Ostkaka - This is a cheesecake, but not like American/British cheesecakes. 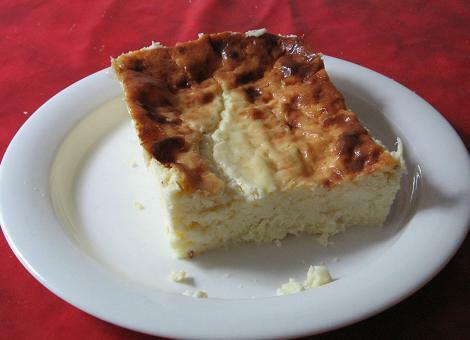 It is prepared by baking a cake made from milk curd (or nowadays cottage cheese). Normally ostaka is served with jam and whipped cream, or fruit and ice cream. Spettekaka - This dessert from southern Sweden is made using eggs, potato flour and sugar. The mixture is put on a skewer and cooked over an open fire until it becomes very dry and crispy (after cooking precautions are taken to retain this dryness). The cakes can be very small or even several feet (over a meter) in length - the large cakes needing to be cut with a hacksaw as they shatter if you attempt to cut them with a knife. Spettekaka is normally served with vanilla ice cream, dark roast coffee and port wine. Knäck - Knäck is a traditional Swedish sticky toffee which is eaten at Christmas. An illustrated cookbook on the classic breads and savory foods of a Swedish smörgåsbord that can be enjoyed for parties and holidays as well as for snacking and small meals. Includes traditional and contemporary Swedish recipes for dishes such as Rye Bread, Chicken Liver Pate, Elderflower Cured Trout, Fresh Cheese, Swedish Deviled Eggs, Buttery Red Cabbage, and infused aquavit liqueurs. Focusing on the flavors and foods native to Sweden, such as fresh dill, horseradish, allspice, juniper berries, fish, blueberries, and apples, Hofberg presents a mouthwatering collection of modern and classic Swedish dishes. From apple pancakes and lingon berry chutney to baby potato salad with asparagus and cod with horseradish aioli, every recipe holds onto Swedish tradition while adding a fresh twist. Gathering inspiration from the ocean, woods, lakes, and farms, Hofberg shows her true passion for Swedish cooking through the simple and entertaining way she prepares her recipes. Beautiful full-color photographs will inspire any cook. Swedish cooking is greatly influenced by its cold, northern location. Winters are long, and fresh vegetables aren’t always available. Root vegetables, however, such as potatoes and beets, do grow plentifully in Sweden and make up the primary source of complex carbohydrates.Swedish food is very mild. The country was never a part of the European spice trade, and many dishes are flavored by a delectable dill sauce. A favorite accompaniment to just about any meal is lingonberry. From breakfast, lunch to dinner, lingonberry jam finds its way to the table.Surrounded by the sea, Sweden makes full use of its abundance. Herring, salmon, and other types of fish are a staple. This Swedish Cookbook has many traditional recipes for preparing seafood the traditional Swedish way. Potatoes, especially boiled, accompany many seafood dishes. Herring and boiled potatoes are a national favorite.While there are many types of bread in Sweden, everyone loves their crispbread, which can be topped by just about anything. 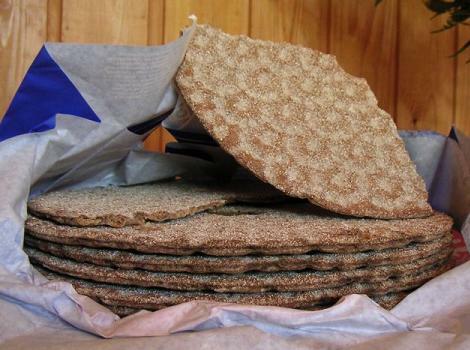 This Swedish Cookbook has some great ideas for the perfect crispbread sandwich.The recipes in this Swedish Cookbook are tasty, easy-to-prepare and will make you feel like a Viking. Skoal!